Beautiful Boundary Water Canoe Area location where wildlife abounds. 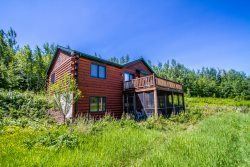 Poplar Creek Retreat is a cabin set deep in the woods on the picturesque Gunflint Trail Scenic Biway This beautifully maintained 2-bedroom, 2-bathroom home is the perfect retreat from the hustle and bustle of daily life. Located on a large wooded lot, you will feel miles away from it all. This cabin is located on Poplar Creek with shared access at Little Ollie Lake. The open living area feels spacious and inviting with vaulted ceilings and log cabin comforts. The gas fireplace is great for cold nights. The futon in the living room area also serves as the third sleeping area, making this cabin large enough for up to 6 guests. Sit around the dining room table and enjoy a home cooked meal or a game of cards. The kitchen has custom cabinetry and is well-equipped for preparing a home cooked meal during your stay. You are in the Gunflint Trail wilderness, but this home offers modern amenities like a dishwasher in the kitchen. The master bedroom on the upper level has a queen size bed with a pillow top mattress. The attached master bathroom has a walk-in shower and two-person jetted tub. After a day trip into the BWAC you can enjoy a good soak in the two-person jetted tub. Grab a shower in the morning before you head out on your next Gunflint Trail adventure. The second bedroom, this one on the main level, has another queen size bed with pillow top mattress. The guest bathroom on the main level has a walk-in shower and washer/dryer- great for extended stays. The bright and cheerful room is a great place to start your morning. The bonus 3-season sun porch is great for sitting down with a cup of coffee and trying to spot an elusive mother moose. Poplar Creek Retreat has been a favorite Gunflint Trail destination for many years. Book for your next stay near the beautiful Boundary Waters Canoe Area. Head down the trail by the home for access to Poplar Creek and Little Ollie Lake. Head down the trail by the home for access to Poplar Creek and Little Ollie Lake. Sit around teh campfire and enjoy the sounds of nature, where spotting another human is a rare occurrence. Although, on the Gunflint Trail, moose aren`t that rare- guests at Poplar Creek Retreat often report moose spottings. Poplar Creek Retreat as you will see it when you pull into the driveway. When you see this, you will know you are home. Poplar Creek Retreat is a beautiful, secluded cabin located midway up the Gunflint Trail. All the modern conveniences with the ambiance of a North Woods cabin. Here you are just a short walk to Little Ollie Lake with easy access to Poplar Lake and the BWCA canoeing, plus access to miles of mountain bike, snowshoe, and X-Country ski trails. The home boasts two bedrooms and two bathrooms on two cozy levels. There is a 3-season sun porch, gas fireplace, and you have access to 475 feet of shared Little Ollie Lake shoreline with a seasonal dock. This cabin is perfect for any North Shore vacation be it a personal retreat, romantic getaway, or gathering with friends and family. Passing through the town of Grand Marais, MN you will find the entrance to the Gunflint Trail Scenic Byway near the public library, marked by a statue of a voyageur and his canoe and a black bear. Take this remote wilderness road up to Poplar Creek Retreat, roughly 35 miles away. Along the way, you are certain to spot many wildlife creatures. These can include deer, bear, fox, wolf, and even moose! In the springtime, many of Poplar Creek Retreat's visitors have reported seeing mother moose with their calves, a sight that is becoming more and more rare all over the world. Take a day trip into the BWAC or hop over to the Trail Center Lodge for a bite to eat. Head down the trail into the quiet, peaceful town of Grand Marais for a day of shopping and dining at the many restaurants that make this quaint town so unique. Whatever your plans may be, Poplar Creek Retreat is an idyllic, peaceful home base for your next trip up the Gunflint Trail. *Please note that a 4x4 vehicle is required in the winter. Please do not book this property unless you have the proper vehicle. The road leading to the property and the driveway can both be very steep and slick in the winter time and plowing/sanding in this part of Minnesota is limited. You may also experience a higher snowfall here than in other areas and snow may cover the area from October into May some years. Cell service is also not available or very limited in this area. Please pack an emergency kit in your vehicle should you become stranded and need to wait for assistance. This is the second year we have stayed in this house and will do it again! Wonderful experience all around. Love this house! Very clean and cosy. The kitchen is the bomb! Enjoy cooking in there. Having the laundry facilities is wonderful since is was very soggy on the trails. We didn't see any moose this year which was disappointing, but we did see their footprints all over. Loved it! The vaulted ceilings were gorgeous, loved the spacious kitchen and fireplace especially. Was very helpful to be able to bring our dog. Everyone I have every dealt with at Cascade is amazing! Our stay was amazing as always! This was our 5th year renting from Cascade and our 2nd year staying at Poplar Creek Retreat. We look forward to our North Shore anniversary trip every year and we have introduced the tradition to our brother and sister-in-law. The Poplar Creek location is wonderfully secluded & peaceful. Although we missed the moose this year we saw a bear, deer, beaver, etc. The fishing was great and we even caught the Northern Lights one night! Can't wait till next year! My new wife and I spent our honeymoon at this rental and we both loved it. We definately will be coming back to stay here next fall to celebrate our anniversity. The home is very comforting and relaxing with beautiful scenery to go along with it. A perfect getaway to get lost at and to relax after months of planning a wedding. The house was nestled out in the middle of what seemed like no where. Very secluded. Nice hiking available. Could hear the stream next to it when you slept. Abundant wildlife, had moose in the yard and a fox.